The ComfileHMI is a WYSIWYG development kit for HMI projects. Water-resistant and open-frame models are available. No branding on the hardware's front panel (logo-less). Supports TrueType fonts and Unicode for creating multilingual user interfaces. Supports PNG, JPG, and BMP image files. The ComfileHMI can be used to control the CUBLOC, MOACON, FA-DUINO, MODPORT, or just about any other Modbus-capable PLC or microcontroller. This product is intended for first-time ComfileHMI users. 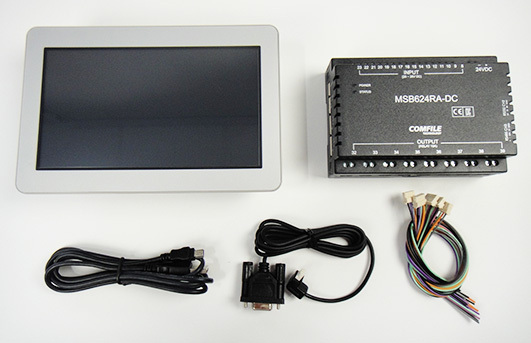 Click the button below to add the ComfileHMI Start KIT 2 (Human machine interface, HMI with PLC) to your wish list.